Totally occluded coarctation of the aorta is generally rare. The clinical presentation and response to treatment of patients with isolated totally occluded coarctation of the aorta is similar to that of the patients with isolated severe coarctation of the aorta. Percutaneous treatment of such a lesion using radiofrequency perforation, perforation with the stiff end of a guide wire followed by balloon dilation, and stenting has been reported predominantly in adults.,,,, The success and challenges of this procedure in children is reported in a few patients so far., We report our experience in three consecutive children who were treated at our center. We retrospectively reviewed the records of children treated for occluded coarctation of the aorta. 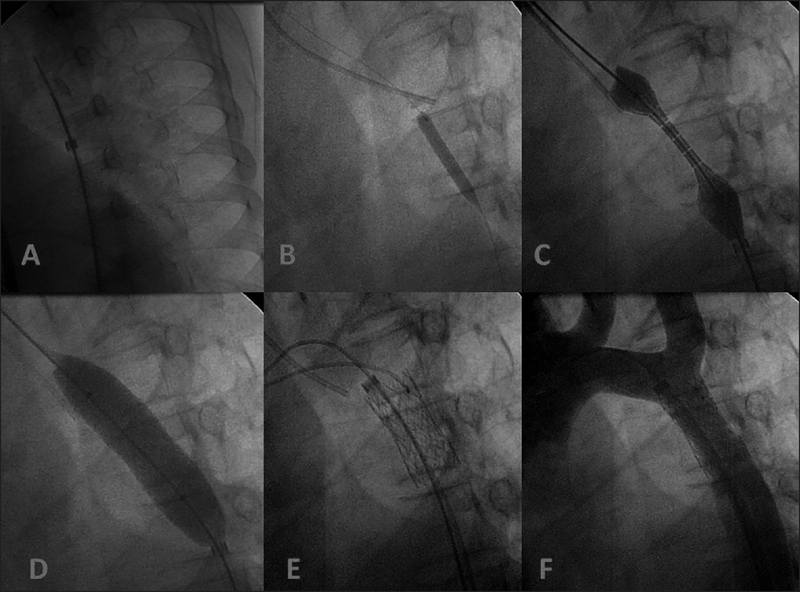 During the period of 2014-2015, three patients have undergone percutaneous recanalization for completely occluded coarctation of the aorta using Brockenbrough needle and a covered stent. We reviewed the demographic, clinical, imaging, and catheterization data of the patients. The institutional review committee approved the study. Details of blood pressures and other baseline characteristics of the patients are shown in [Table 1]. Diagnosis of coarctation of the aorta was suspected in all patients clinically after upper limb hypertension and weak femoral pulses were detected. Echocardiography showed anatomic juxtaductal coarctation of the aorta but with no detectable turbulence by color Doppler mapping or significant pressure gradient by continuous wave Doppler interrogation. Pulsed wave Doppler and color flow interrogation of the abdominal aorta showed loss of pulsatility with marked diastolic extension. All the patients were given medical treatment with a combination of diuretics, calcium channel blockers, and acetylcholinesterase (ACE) inhibitors. However, the blood pressure was not controlled with the medical management. Under general anesthesia and onsite surgical backup, right femoral artery access was established with appropriate short sheaths. Multipurpose catheter 4F or 5F was introduced up the descending aorta. After heparin (100 IU/kg) was administered intravenously, a.0353 straight Terumo wire was advanced through the catheter. The wire failed to advance to the aortic isthmus. Hand injection of contrast showed a blind loop of aorta that is not continuous with the aortic isthmus [Figure 1]a. The aortic arch was accessed through the radial artery with a 3F right coronary catheter in the first two patients. In the 3rd patient whose weight was 16 kg, the arch was accessed through a transseptal puncture. Simultaneous arch angiogram and descending aorta angiogram were performed with a hand injection in the anteroposterior and lateral projections [Figure 1]a and [Figure 1]b. After making sure that the two catheters [proximal and distal were well aligned in two orthogonal views (anteroposterior and lateral views)], the distal catheter was removed and a 7F long sheath was introduced over a regular wire. Proper alignment with the cephalic blind end of the interruption was checked once more in two orthogonal views. In all the three patients, a pediatric Brockenbrough needle (Medtronic Inc., Minneapolis, MN, USA), the curve of which was adapted to the observed anatomy was advanced through the dilator lumen. The caudal atretic end of the interrupted segment was carefully punctured [Figure 2]a, under pressure monitoring and orthogonal fluoroscopic guidance (intermittent, since performed on a monoplane equipment), contrast was injected through the needle to confirm that the puncture was successful. A floppy-II,.014 inch PTCA wire (Abbott Vascular, Santa Clara, CA, USA), was advanced through the needle deep into the left or right subclavian arteries. A 4 mm × 20 mm NC TREK balloon (Abbott, Abbott Park, Illinois, USA) was advanced over the wire and inflated across the punctured atretic segment [Figure 2]b. A 4F multipurpose catheter was then advanced over the coronary wire, which was exchanged for an Amplatz supersitff.035” × 260 cm (St Jude Medical Inc., MN, USA). Verapamil infusion 0.2 mL/kg of 2.5 mg/10 mL (0.05 mg/kg) over 5 min was used just before the introduction of the long delivery sheath and right after its removal. A covered stent of proper length was selected to completely cover the coarcted segment and hypoplastic isthmus as well as some millimeters of the poststenotic aorta. Diameter of the balloon was selected to approximate the arch, which was typically also hypoplastic. In two patients, premounted Advanta V12 (Atrium Medical Corp., NH, USA) stents were used [see [Table 2]. In the larger patient, a covered CP stent (Numed Canada Inc., ON, Canada) mounted on a 14 mm × 2.5 cm BiB balloon (Numed Canada Inc., ON, Canada) was used. Stents were advanced through a 9-12 Fr sheath. Multiple hand injections were necessary to adjust the position of the stent so that it can cover the entire hypoplastic isthmus while avoiding jailing of the left subclavian artery. The balloon was then inflated [Figure 2]c. The stent achieved a stable position in all cases [Figure 2]d and [Figure 2]e. Check angiogram was done with a hand injection through the sheath [Figure 2]f. Then the stents were postdilated with bigger balloons. Mullins balloon 15 mm × 40 mm (Numed Canada Inc., ON, Canada) was used to postdilate the Advanta stents while Z-Med 15 mm × 40 mm (Numed Canada Inc., ON, Canada) was used to postdilate the CP stent. Fluoroscopy time ranged from 24 min to 49.4 min. Recanalization and implantation of a covered stent was successful in all patients. Femoral artery and dorsalis pedis pulsations became strong. Lower limb pressures increased and upper limb pressures decreased. Although minimal or no gradient was present across the stent, all patients showed some gradient at the hypoplastic arch level [Table 2]. The patients were transferred to the intensive care unit and continued on antihypertensive management with heparin 20 U/kg/h until the recovery of normal distal pulses on the punctured limb and restriction of oral feeding, for a minimum of 12 h. Acetylsalicylic acid 5 mg/kg was started on the following day. Hospital stay ranged between 4 days and 5 days. Details of treatment and immediate postoperative course of the patients is shown in [Table 2]. A 14-year-old patient developed postcoarctectomy syndrome and paradoxical upper limb hypertension 12 h after the procedure. She had severe abdominal pain and one episode of vomiting. She was managed with potent analgesics and more prolonged restriction of oral feeding. The antihypertensive management was intensified. She stabilized within 48 h following the procedure. During a follow-up period of 17 months, hypertension resolved in two patients. Hypertension persisted in one patient who had features of dilated cardiomyopathy before the procedure. This patient remained on antihypertensive drugs. She fully regained her left ventricular systolic function and her mitral regurgitation became mild. All the patients were in New York Heart Association (NYHA) class I functional status at the last follow-up visit. All the patients had strong right femoral pulsation and palpable dorsalis pedis pulse [Table 3]. Juxtaductal coarctation is one of the most common congenital malformations of the great vessels. Totally occluded coarctation of the aorta, which typically presents in the older child or adult, seems to represent a progressive obstruction of the coarcted segment and is thus a different entity than the interruption of the aortic arch, which develops prenatally and evolves quickly and dramatically in the neonatal period, with the closure of the arterial duct. Totally occluded coarctation of the aorta is a rare malformation that was treated surgically in the past. However, in the last decade percutaneous recanalization using different techniques has been reported.,,, Most of the reports included adult patients.,, The techniques used included radiofrequency perforation, perforation using stiff end of a guide wire, and coronary chronic total occlusion technique. A case of an adult patient being treated using the Brockenbrough needle technique has also been reported in the literature. Few cases exist in the literature regarding percutaneous treatment of this lesion in children., Percutaneous treatment of totally occluded coarctation of the aorta in children has its own technical challenges due to smaller body weight and smaller vessel size. The size of the femoral arteries in two of our smaller patients (16 kg and 19 kg) allowed only the use of regular Advanta V12 premounted stents, which could be advanced over a 9 Fr sheath. This series of Advanta V12 stents have a smaller potential for redilation than the “larger diameter” series (starting at 12 mm, but needing larger sheaths). Since there will inevitably be a need for stent redilation or stent-in-stent implantation as the child grows, there is a clear possibility that even once maximally dilated, the resultant diameter will not be sufficient to avoid residual gradient in an adult patient, even with significant collateral flow. In these cases, a new covered stent needs to be implanted and re-dilated with ultra-high pressure balloons to intentionally fracture the V12 stent though we do not yet have such an experience and do not think that it will be easy to fracture a covered Advanta stent. As for the patient who received a Covered CP-stent, it can be easily radiated to up to 25 mm, and thus she will need simple redilatation. Although one could argue that these two interventions represent a significant cumulative morbidity, it has to be underlined that surgical correction of such complex coarctation in these fragile patients with severe congestive cardiac failure and severe ventricular dysfunction is also a challenging intervention with its own set of complications, especially in developing countries, where trained pediatric cardiac surgeons are rarely available on a regular basis. Besides, surgical repair of this lesion does not guarantee that a patient will not need reintervention as some of these patients treated surgically may still develop recoarctation., Though it might be difficult to estimate the cost of percutaneous intervention in our setting where we get most of the consumables on donation, other studies have suggested that the cost of percutaneous intervention was not higher than that of the surgical repair of occluded coarctation of the aorta. Although all patients had residual gradients at the end of the procedure, almost all of it was due to arch hypoplasia, which might improve with time, after the normal antegrade flow is established. The absence of significant gradients between the arms and lower limbs on cuff-measured blood pressures on follow-up seems to confirm this favorable evolution. Percutaneous recanalization of totally occluded coarctation of the aorta using the Brockenbrough needle followed by stenting with a covered stent in children is a feasible and effective mode of treatment. However, the need for stent redilation or stent-in-stent implantation may be anticipated as the child grows. In some of these children, postcoarctectomy syndrome may occur following the procedure, therefore, the anticipation and planning of management is important. We thank the Children's Heart Fund Cardiac Center where the work was done. We also extend our gratitude to the members of the Sainte-Justine, Montréal, cardiac mission and the local staff who participated in the care of these children. The authors report no financial relationships regarding the content herein. The authors report no conflict of interest regarding the content herein. Backer CL, Mavroudis C. Congenital heart surgery nomenclature and database project: Patent ductus arteriosus, coarctation of the aorta, interrupted aortic arch. Ann Thorac Surg 2000;69(Suppl):S298-307. Joseph G, Mandalay A, Rajendiran G. Percutaneous recanalization and balloon angioplasty of congenital isolated local atresia of the aortic isthmus in adults. Catheter Cardiovasc Interv 2001;53:535-41. Goel PK, Syal SK. Percutaneous reconstruction of aortic isthmus atresia using coronary total occlusion technique. J Cardiol Cases 2014;10:121-4. Yazici HU, Ulus T, Temel K, Nasifov M, Bridane A, Göktekin O. Percutaneous treatment of totally occluded the coarctation of the aorta with angioplasty and stenting. Eur Rev Med Pharmacol Sci 2012;16:96-9. Lenk K, Dähnert I, Schuler G. Complete occlusion of the aortic isthmus. Eur Heat J 2008;29:30. Butera G, Heles M, Carminati M. Percutaneous treatment of aortic isthmus atresia: Use of radiofrequency perforation and covered stents. Catheter Cardiovasc Interv 2011;78:933-9. Ewert P, Abdul-Khaliq H, Peters B, Nagdyman N, Schubert S, Langeb PE. Transcatheter therapy of long extreme subatretic aortic coarctations with covered stents. Catheter Cardiovasc Interv 2004;63:236-9. Almashham Y, Dahdah N, Miro J. 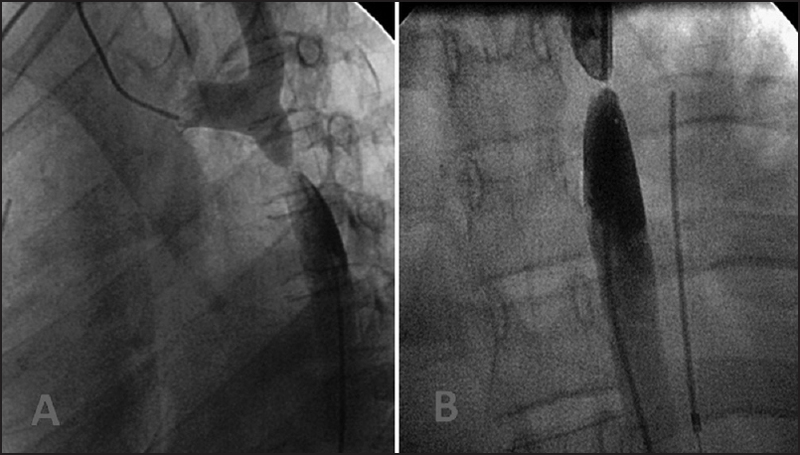 Use of radiofrequency then stent implantation for recanalization of complete aorta coarctation. Pediatr Cardiol 2008;29:207-9. Narin N, Onan SH, Baykan A, Sezer S. Transcatheter antegrade perforation and covered stent implantation to subatretic coarctation. Anadolu Kardiyol Derg 2012;12:442-3. Roberts WC, Morrow AG, Braunwald E. Complete interruption of the aortic arch. Circulation 1962;26: 39-59. Bruckheimer E, Dagan T, Amir G, Birk E. Covered cheatham-platinum stents for serial dilation of severe native aortic coarctation. Catheter Cardiovasc Interv 2009;74:117-23. Ibarra-Pérez C, Castañeda AR, Varco RL, Lillehei CW. Recoarctation of the aorta. Nineteen year clinical experience. Am J Cardiol 1969;23:778-84. Yetman AT, Nykanen D, McCrindle BW, Sunnegardh J, Adatia I, Freedom RM, et al. Balloon angioplasty of recurrent coarctation: A 12-year review. J Am Coll Cardiol 1997;30:811-6. George JC, Shim D, Bucuvalas JC, Immerman E, Manning PB, Pearl JM, et al. Cost-effectiveness of coarctation repair strategies: Endovascular stenting versus surgery. Pediatr Cardiol 2003;24:544-7.